This is where many of the world's old and unwanted electronic products, such as computers, mobile phones, hairdryers and television sets, come to die. Most are stripped of valuable metals, such as gold or copper, before being given their final rest. Those still functioning well get a second lease of life as second-hand goods. Welcome to Guiyu in China's southern Guangdong province, a town that has been known widely as the world's electronic graveyard for over two decades. About 70 per cent of all global e-waste - defined as any device with an electric cord or battery - make their way to China through nearby Hong Kong or Guangdong's capital Guangzhou. Most end up in Guiyu, the largest of several e-waste dumping sites that include Taizhou city in eastern Zhejiang province. According to media reports, some 1.6 million tonnes of e-waste pass through Guiyu yearly, with recycling worth 3.7 billion yuan (S$818 million) annually. Used electronic products reportedly began arriving from the mid-1990s and accumulated into massive landfills in Guiyu, which is administered by Shantou city and is about two hours' drive from Guangzhou. Guiyu's fame spread from 2001 with a documentary Exporting Harm by the Basel Action Network, a non-profit organisation tackling the practice of toxic waste export to developing countries. At its peak in the early 2000s, the town's 5,000 workshops were recycling 15,000 tonnes of e-waste daily. Recycling is encouraged in China, as it is with many other countries, but the problem is how it has been done in Guiyu, which uses primitive methods that threaten the workers' health and the local environment. Many e-waste workers strip apart the electronic devices with their bare hands or melt the plastic circuit boards to salvage bits of valuable metals with little protective gear. Such work often takes place by the streets, releasing large amounts of pollutants, heavy metals and chemicals into the rivers nearby, severely contaminating local water supplies, devastating farm harvests and damaging the health of residents. A study last August by researchers at Shantou University Medical College found that Guiyu children have abnormally high levels of lead in their blood. But e-waste recycling continues to thrive in Guiyu due to the lucrative nature of the work. An e-waste worker in Guiyu can earn around 150 to 200 yuan daily for 10 hours of work, up to 11/2 times more than the wages of similarly low-skilled workers. A report by the Germany-based United Nations University in April this year estimated that the retrieved materials, including gold, silver, iron and copper, were worth US$52 billion (S$71.3 billion). The high profitability explains why some 80,000 of Guiyu's 130,000 residents remain involved in such hazardous work. • Some 41.8 million tonnes of electronic waste - defined as any device with an electric cord or battery - were dumped worldwide last year, with only about six million tonnes recycled properly, according to the United Nations University. • The global e-waste volume is forecast to rise by more than 20 per cent to 50 million tonnes in 2017, fuelled by rising sales and shorter lifespans of electronic equipment. • The United States tops the e-waste dumping charts with 7.1 million tonnes last year, followed by China with six million and Japan, Germany and India. • The US e-waste production spiked by 13 per cent over the past five years while China's volume nearly doubled. This means China could overtake the US as the world's largest e-waste producer by as early as 2017. • The US reported collection of one million tonnes of e-waste in 2012, while China collected 1.3 million tonnes of equipment such as TV sets, refrigerators and laptops in 2013. • Up to 90 per cent of global e-waste, worth nearly US$19 billion (S$26 billion), is illegally traded or dumped each year, according to a report by the United Nations Environment Programme. • Used electronic products began streaming into Guiyu town in China's Guangdong province, from the mid-1990s, turning it into one of the world's largest electronic waste sites by the early 2000s. 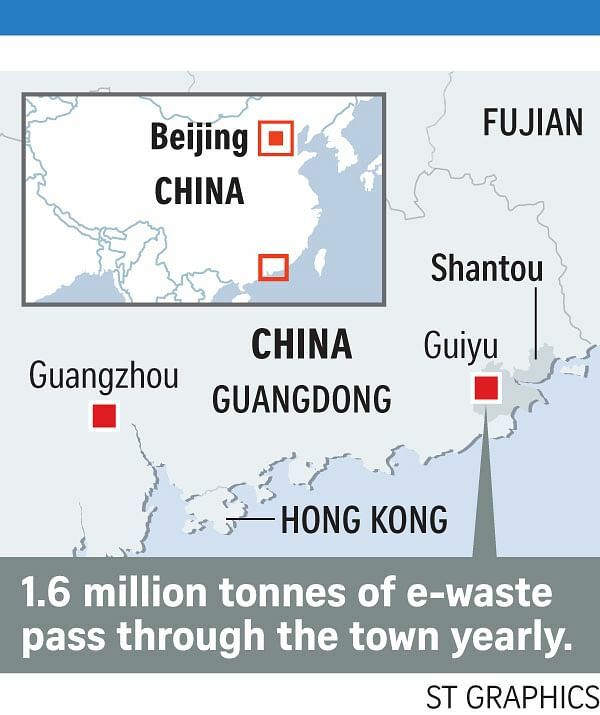 • More than 1.6 million tonnes of e-waste pass through Guiyu yearly, with up to 80 per cent of the town's residents involved in the e-waste recycling industry worth 3.7 billion yuan (S$818 million) annually. Rising demand will keep them in the job. Due to the shorter lifespans of electronic products, the global volume of e-waste is expected to grow to an annual 50 million tonnes as early as 2017, up from 41.8 million tonnes last year. "We are witnessing an unprecedented amount of electronic waste rolling out over the world," said United Nations Environment Programme executive director Achim Steiner in May at the launch of a report on the challenge of e-waste. The report also listed ways for countries to combat the challenge, such as strengthening awareness, monitoring and information by mapping of scale, routes and state of hazardous waste; and beefing up legislation and enforcement. The Chinese government has made efforts to clean up the e-waste industry since the early 2000s, such as banning the illegal imports of e-waste and launching a nationwide programme swopping old electronic goods for new ones. With China also producing its own e-waste, on July 6 four government ministries issued new guidelines to expand an ongoing initiative since 2012 to promote recycling across the country of such waste, including television sets, fridges, air-conditioners, washing machines and computers. But experts say more needs to be done as the challenge is growing fast. Through its growing affluence that has piqued demand for electronics, China has become the world's second-largest producer of electronic waste with 6 million tonnes, trailing the United States' 7.1 million tonnes. "Before, the waste was shipped from other parts of the world into China - that used to be the biggest source and the biggest problem," Mr Ma Jun, director of the Institute of Public and Environmental Affairs, was quoted as saying in media reports last October. "But now, China has become a consuming power of its own. We have, I think, 1.1 billion cellphones being used, and the life of our gadgets has become shorter and shorter... It's going to be a bigger problem." Dr Du Huanzheng, an environmental activist who has worked with the Guiyu government on tackling the e-waste problem for the past seven years, said it would take time for China to see results in managing the problem. That is because it has to strike a balance between ensuring the livelihoods of e-waste workers and environmental protection, said Dr Du, who teaches at Tongji University and used to head an independent think-tank on environmental issues. For instance, an industrial park with better waste-processing facilities set up in Guiyu - an initiative he was involved in - has remained largely vacant as many of the town's e-waste workshops are family-run businesses that are unable and unwilling to pay the higher rents. "At least we're trying our best, which is better than doing nothing at all," he told The Straits Times.